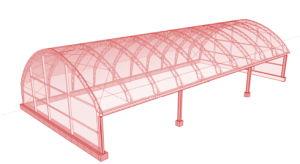 The Easy Access Building Series is a new style of building to the fabric industry. Its unique feature is that it allows one to have easy access to the entire building from the side with the fabric cover finishing high on the arched side of the building. Customers can orientate their building to allow convenient traffic flow and easy access to the side of the building.